The Utah Philharmonic is running their annual concerto competition. If you decide to enter, please add to the "special considerations" box a request to audition no earlier than 1 pm so you have time to attend rehearsal that day as well. Submitting your application early will also give them a chance to schedule that way. Our 14th Annual Concerto Competition - registration is now open! Hello. My name is Roger Morandi. I am UPO Board Secretary and principal oboe with the Utah Philharmonic Orchestra, a multi-community orchestra based in the southern Salt Lake valley in Bluffdale, UT. 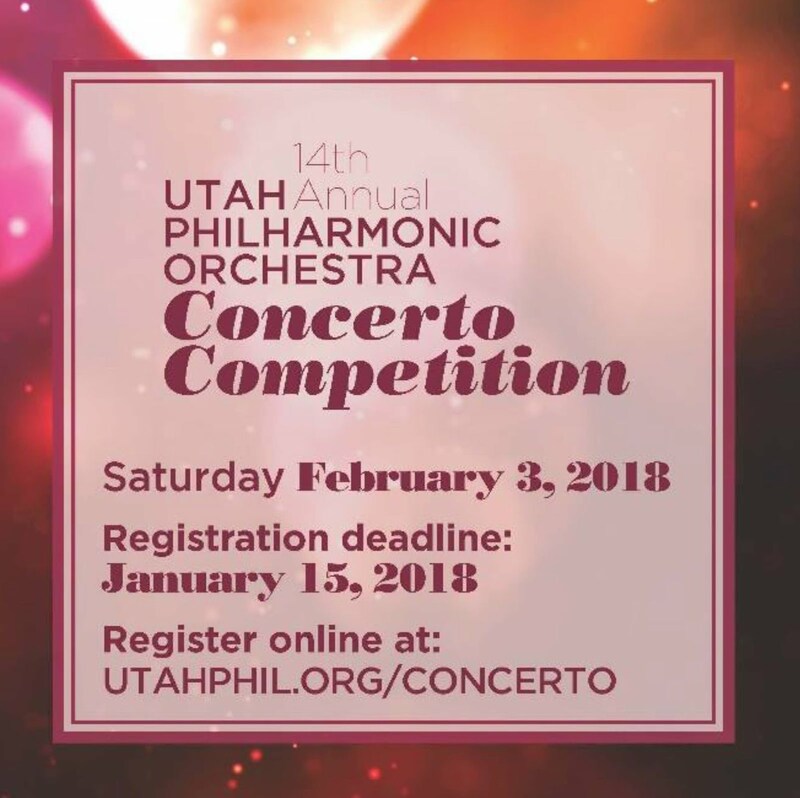 The Utah Philharmonic Orchestra is excited to announce that the UPO's 2018 Concerto Competition is open for registration! Winners of our Fourteenth Annual Concerto Competition will be invited to perform with the Utah Philharmonic Orchestra at our Spotlight Spectacular concert in May 2018. I hope you are willing to make this opportunity available to your Northern Utah Youth Symphony and Northern Utah Chamber Orchestra students, private and school students, other music instructors and musician friends. I have attached a JPG file of our Concerto Competition Announcement Poster to this email. Please forward this email to any student or performer you know who would like to compete for the opportunity to solo with a live orchestra. Alternatively, the poster can be printed to be distributed at rehearsals, hung on your bulletin board or placed anywhere that interested students may pick one up. Register by going to www.utahphil.org/concerto and clicking on Register Online. Applicants are now able to complete the entire registration process on-line, no mailing required. The registration deadline is Monday, January 15, 2018. Late registration is available after the deadline until the day of the competition with anadditional $10.00 late fee. The competition date is scheduled on Saturday, February 3, 2018 at Riverton Music Store, 9491 S 255 W, Sandy, UT. Here is some basic information about the competition. Vocalists - age 13 and over. Each category will be judged by a panel of three judges selected from members of our Symphony and from working music professionals along the Wasatch Front. In addition to the five category winners, our judges have the option to invite the Youth category runner-up to perform. You can find complete competition details, an informative FAQ page and a link to the online registration page at www.utahphil.org/concerto. We also have a list of ineligible works for 2018. This list includes the works performed by the winners of the last two years of competition. These works are excluded from competition to increase variety and to avoid repetition of the same piece every year. Applicants should be sure to review this list before registering to avoid any confusion. I sincerely appreciate your time and attention to this email and hope you will be willing to forward this opportunity to your students and other interested musicians. If you have any questions or would like further information, please contact us by phone at 1-888-239-6237 or by email at concerto@utahphil.org. Thank you again for your time and for your help to spread the word about this performance opportunity. I hope everyone is doing well. I suspect many of you are deep into music preparations for holiday concerts at this time of the year. I wanted to be sure you know about a great scholarship program for young musicians, age 8-18. The Jack Kent Cooke Foundation, in partnership with NPR's From the Top, offers these awards each year. There are two application deadlines remaining in the 2017-18 season. The link below has all the information about the award and how to apply.